One question I get asked is how to clean up difficult timbers and burrs when used in veneer form. My answer is "use a cabinet-scraper". Being trained as a restorer not a maker gives me a different slant to certain woodwork problems. In solid timber, a well set sharp plane will usually do the job, but in veneer work and also on the solid, a scraper plane is very useful. You could do the job with a card scraper but many people find them hard to use and they can leave a slightly undulating surface due to the bow that you need to put on them in use. Of course there is also the problem of burnt thumbs! 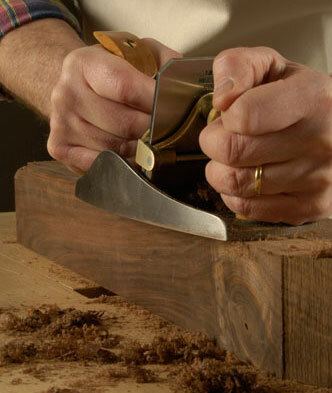 This Lie-Nielsen No.112 Scraper Plane is based on the Stanley 112. It is a heavy plane with a flat sole and an adjustable blade angle. First of all you get no burnt thumbs and no dig-in because the body keeps the blade true to the surface. The big heavy blade is infinitely adjustable. Those that have used a card scraper will know that the angle at which you use the scraper is vital. You need to get a feel for how the tools work and how to make minute adjustments in order to get a good result. This plane allows you to make tiny adjustments to the angle of the blade on a piece of scrap until you get it right. As you tilt the blade, the projection is changed as well as the angle of attack, so you will need to be alert to the need to re-set the projection if you get blade chatter as you adjust the tilt angle. However, once you have experimented for an hour or so on a wild grained scrap, you should have learnt the fine tuning necessary to get very good results from this plane. Two toothed blades are also available for keying up veneers and groundwork. 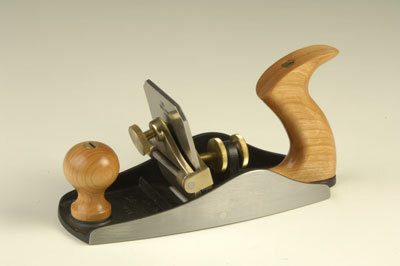 I also have a small scraping plane from Lie-Nielsen and I'll be reporting on that in the next issue. I was impressed by the feel and performance of this Lie-Nielsen plane, and the results did not disappoint. With a bit of patience and practice, this tool makes a very useful addition to any furniture maker's toolbox and for my students, is the answer to cleaning up those problematic timbers and burrs in veneer work. "I was impressed by the feel and performance of this Lie-Nielsen plane"